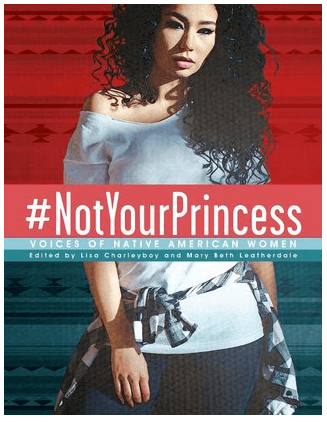 Review: #NotYourPrincess is another fabulous collection brought to us by Lisa Charleyboy and Mary Beth Leatherdale. The magic of the book is that the many voices are seen and heard through a wide variety of formats with the design of the book framing the pieces beautifully. In most cases artwork compliments the texts and the words provide context for the artwork. There are images on nearly every spread and it’s a magnificent visual experience. There are also many examples of confident young women who are using their strengths. We see young women like AnnaLee Rain Yellowhammer (Hunkapapa, Standing Rock Sioux) who are demanding to be heard. She’s an activist fighting the Dakota Access Pipeline and has been raising her voice loud and clear in defense of the land, water, and her tribe. Lisa Charleyboy describes this as a “love letter to all young Indigenous women trying to find their way.” This is an excellent description. Readers will find love and encouragement here on every page. Recomendation: #NotYourPrincess should be available in all young adult collections. Get it as soon as it’s available.